The term lo mein means “stirred noodles”. 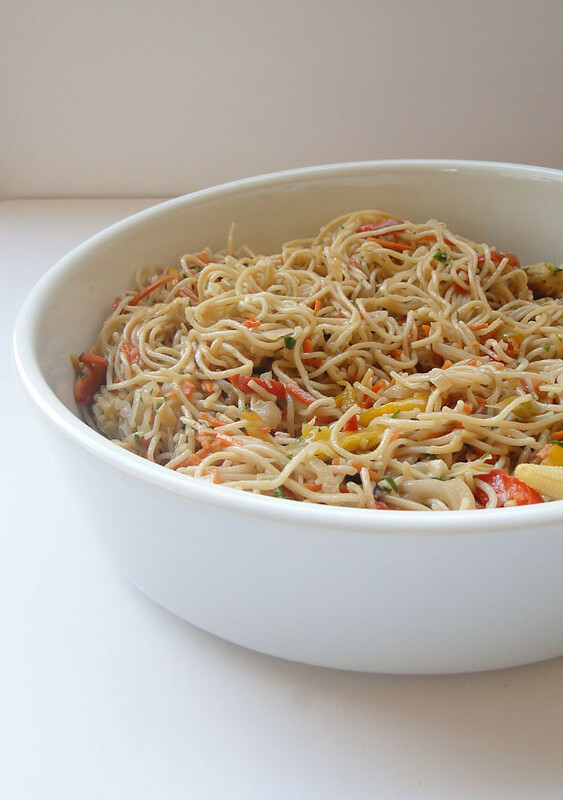 Lo mein noodles are usually stirred with a sauce made from soy sauce and other seasonings. Many vegetables can be mixed in and roast pork, beef, chicken and even shrimp are often added. This dish is ideal for a weeknight dinner, or when you feel like a simple meal. A melange of colorful and crispy vegetables make this dish wholesome and very tasty! In a large nonstick skillet or wok, heat 2 tbsp of sesame oil, toss the chicken and the ginger and stir-fry for 5 minutes or unitl browned. Remove and keep warm. Stir-fry peppers and carrots in remaining oil for another 5 minutes. Add cabbage, onions and garlic; stir-fry 3 minutes longer or until vegetables are crisp-tender. Meanwhile, bring salted water to boil in a pot. Add the noodles and cook for 2 mn only. Place them in cold water to stop the cooking process. Drain. Stir the noodles into vegetable mixture. Return chicken to the pan; cook and stir until heated through. Add the soy sauce, season with salt and mix. Dans une grande poêle anti-adhésive ou dans un wok, faites chauffer 2 cas d'huile de sésame et faites sauter le poulet avec le gingembre pour 5 mn ou jusqu'a ce que le poulet soit cuit. Réservez. Dans la même poêle, faites revenir les poivrons et les carottes environ 5 mn. Ajoutez le chou, l'oignon et l'ail. Faites revenir le tout environ 3 mn jusqu'a ce que les légumes soient cuits. Pendant ce temps, faites bouiller de l'eau salée et faites cuire les noodles environ 2 mn. Placez les ensuite dans de l'eau froide pour stopper la cuisson et égouttez. Ajoutez les noodles aux légumes. Ajoutez le poulet, laissez cuire qlq minutes. Ajoutez la sauce soja et assaisonnez de sel. Mélangez. Wonderful! Stir-fries are always so tasty. Your photos are so beautiful it makes me want to make this dish asap! YUM! 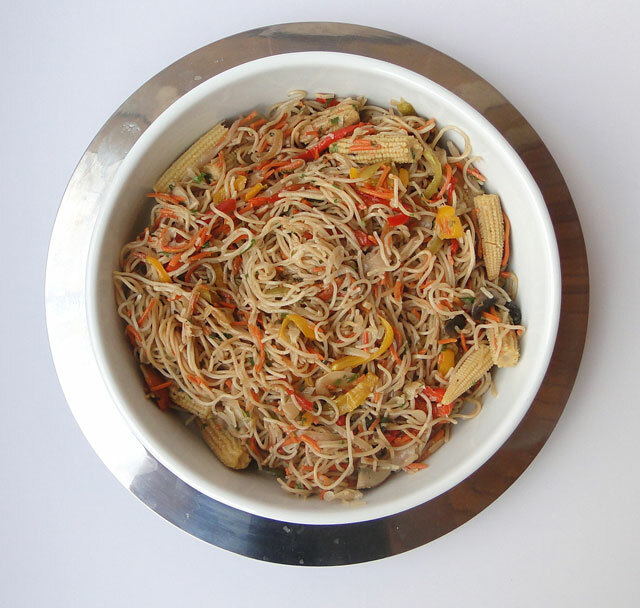 I love stir fry, especially with noodles - it looks great! 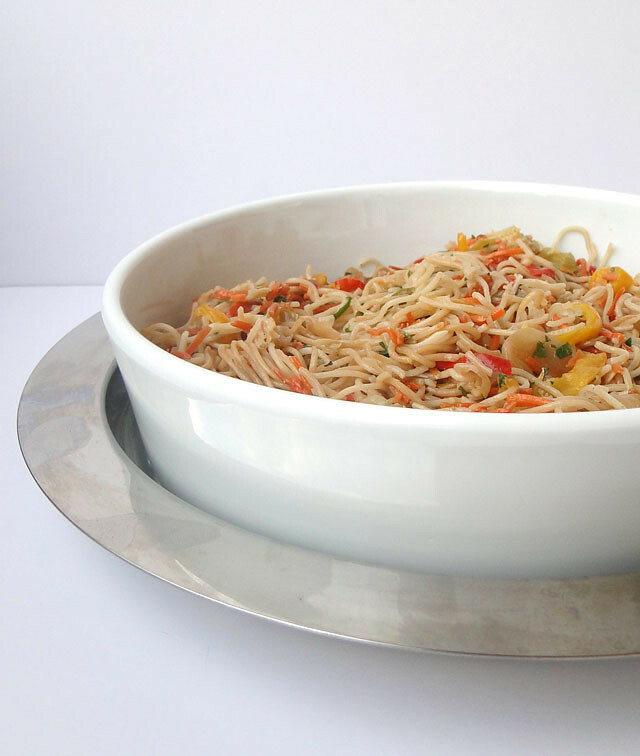 Un plat simple rapide et savoureux ! I love lo mein and used to make it often. It somehow slipped out of the regular rotation. Thanks for the reminder of this great dish. I need to make it again soon! Your chicken noodle looks very tasty! This is one of my favorite Chinese take-out dishes! Your looks so much better! I'm inspired to make it at home now. This is one of those "must-know-how-to-make" recipes. :) Lovely. This recipe looks delicious! I will have to add this in my favorite recipe book. I hope you can post more updates about stir fry. By the way, I saw a great site while I'm searching about stir fry recipe, just Browse Here to visit. We needed a recipe like this for this weekend! Thank you!